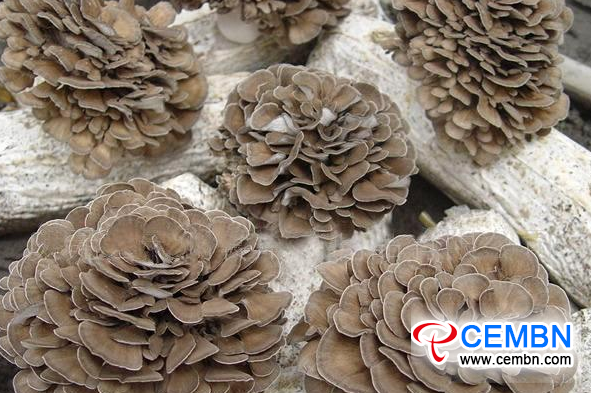 During the cultivation process of Grifola frondosa, Yellow Sticky Fungus (黄黏菌) and Penicillium Notatum (青霉菌) are common diseases and pests. 1. Yellow Sticky Fungus: No cytoderm, it is a mass of protoplasm which moves and spreads quickly. Unfortunately, it directly devours mycelia and sporocarps of Grifola frondosa and leads to the decomposition of sporocarps. CONTROL MEASURES: Firstly, enhance the ventilation, especially in rainy season. And, avoid standing water on mushroom film. In aisles, growers could put a layer of thin soil or scatter with lime to prevent the transmission of Yellow Sticky Fungus. 2. Penicillium Notatum: Grifola frondosa is poor on aspect of antibacterial ability, Penicillium Notatum is frequently seen on surface of fungi bed after growers open up nutrient bags or earth up. Bags contaminated by Penicillium Notatum refuse to fruit, thus seriously affecting final output. CONTROL MEASURES: When growers find Penicillium Notatum, it is suggested to spray bactericide to the infected part, which plays certain inhibiting effect. 3. Other flies and mosquitoes: Sporocarps of Grifola frondosa hold heavy fragrance that attracts flies and mosquitoes, Vermiform larvae eat, drill holes on sporocarps of Grifola frondosa (Normally in the base of stipes) and result in battered sporocarps. This kind of phenomenon is particularly serious in higher temperature. 1. Do a great job on surrounding environmental sanitation. 2. Spray pesticides around the cultivation field at a regular intervals. A. Install thin gauze in ventilation window of mushroom house to prevent the invasion of pests. B. Kill adult pests by their phototaxis, prepare 1 to 1000 times of Trichlorphon, spray it on glass windows, walls and gauze.